In a single day, Ortega captured more demonstrators than those who were released to house arrest in two weeks of negotiations. The police brutality did not stop hundreds of citizens from waving their blue and white flags and screaming at the top of their lungs: Viva Nicaragua libre! (Long live a free Nicaragua). For the first time, since a de facto state of emergency banning marches was imposed five months ago, demonstrators took to the streets of Managua demanding the complete release of the more than 700 political prisoners. The balance of the audacity: opponents injured, beaten and at least 164 detained by the National Police, which at ten o’clock at night released them under the clamor of citizen pressure and international condemnation. 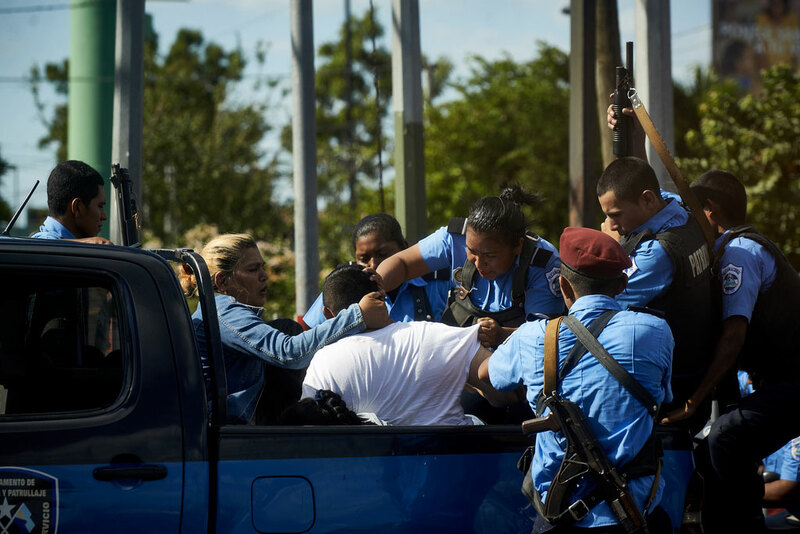 Starting from the early hours on Saturday, the main avenues and all the roundabouts of the capital Managua were militarized by hundreds of police, riot police and motorized mobs. The script fulfilled the order from Ortega’s El Carmen bunker: nobody protests and whoever does receives fists, kicks, sticks and lead, no matter where. However, even when surrounded at commercial and corporate centers nearby, the citizens demonstrated at various points on the avenue that runs from the Central America roundabout to the Metrocentro Mall. Summoned by the Blue and White National Unity coalition, the protesters returned to challenge the regime in the streets, calling for the release of all political prisoners, imprisoned for demanding the resignation of Ortega and Murillo, free and transparent early elections and justice without impunity for the victims of the massacre. The march was scheduled for at two in the afternoon, although the National Police had warned that they would not allow it, as it has done repeatedly since last September, when the regime criminalized all demonstrations and threatened to jail those who marched without police permission, which they would never receive. Business organizations, the Civic Alliance and human rights groups have had to call off their demonstrations after seeing their police permit denied. This time, despite the police rejection, the National Unity coalition maintained its call to march to demand the “unconditional and absolute” release of the more than 600 political prisoners that the regime has in their jails. From the Central America roundabout to the Paseo de la Victoria in Managua was the route established for the march. Little more than a kilometer. The regime was not willing to give an inch of street. The police hit and violently arrested the first citizens who ventured to get to the starting point. The problem for the regime was that more and more continued to arrive. Many more. The building, which bears the same name as the Central America roundabout, was filled with dozens of citizens who sang the national anthem and slogans against the regime from the parking lot of the building. The police could not do anything against them. The administration of the premises prevented them from entering, so from the outside they began to shoot at the citizens. To defend themselves, the opponents used the fire hose and bathed the agents. Riot Police and motorized mobs surrounded the building on all sides. Nobody entered or left. “The cops would not let us out. Then we started screaming at them that we wanted peace. Let us protest,” said one of the demonstrators who was in the parking lot. A few hundred meters north of the building, at a gas station, a group of citizens and journalists from independent media and international agencies met. The police arrived and, without saying a word, pounced on them. More detainees with the same tactic: blows, shoves and to the patrol car. A couple was arrested just for shouting: Freedom, freedom! “Nobody can prohibit you from demonstrating peacefully. Who are we attacking? Nobody,” commented a citizen, before being beaten and arrested by riot police. The reporters were boxed in and sheltered in an external parking lot of the financial center Lafise. Corralling the media has become a tactic of the National Police to prevent documentation of abuses and violations against the population. Reporter Cinthya Torres, of La Prensa, was attacked and cameraman Luis Sequeira, of the international agency France Presse, was beaten by an agent, who stole his camera and other equipment. From that parking lot the patrols were observed passing with their catch. This space became a meeting point for citizens fleeing the police. By that time, it was no longer necessary to carry a flag, a headband or any blue and white emblem to be searched and arrested. Just walking nearby was a crime. The agents looked suspicious on anyone who did not have their same uniform or who was not on a motorcycle, like the Sandinista mobs. Drivers were lowered from their vehicles to be beaten and then arrested. Not even two hours had passed, when the first reports spoke of 50 detainees in all the protest outbreaks, then 60, 80, 100. The list arrived, according to the Unity coalition, up to 164, although the National Police reported, in a statement, of 107 arrested for “violating public order”. Among the detainees were three delegates of the Civic Alliance that participates in the negotiations with the dictatorship: the university student Max Jerez, the lawyer Azahalea Solís, and Sandra Ramos, director of the Maria Elena Cuadra women’s movement. The avenue that goes from the Central America roundabout to Metrocentro became a corridor for police patrols and motorized mobs. There was not a foot of pavement that was not guarded. The police could not enter the buildings and commercial businesses and the citizens did not leave for fear of being arrested. The protestors made the locals where they were surrounded their own and sang the anthem and waved the national flag. They protested in the only way that the regime cannot stop them: cornered but dignified. The police repression was condemned by national and international organizations, as well as by personalities such as Bishop Silvio Baez and human rights defender Vilma Nunez and the governments of Costa Rica and the United States, among others. They all demanded the cessation of police violence and the release of the kidnapped citizens, who were taken to the new cells of the infamous El Chipote interrogation prison. Among those locked in the gas station were Juan Sebastian Chamorro and Jose Pallais, both members of the Civic Alliance, who spoke with the Vatican’s representative, Stanislaw Waldemar Sommertag, to mediate for an exit of all citizens. It was negotiated that people could leave and that they would not be detained or persecuted by the National Police. First came the more than 60 citizens locked in the gas station. Then followed those in the Central American plaza. Finally, dozens of people who were in the Metrocentro Mall, took advantage of the presence of the commissioner general Fernando Borge, second in command of the Managua Police, to express their disagreement with the police action. “They treat us like animals, just for wanting to protest freely. You are not doing me any favors by letting me go. The police violate our rights,” a young girl snapped at the police chief. The newly inaugurated facilities of the El Chipote prison then became the focus of attention in the late afternoon and evening. What would happen to the detainees? In less than three hours, the regime arrested more citizens than those who have been released to house arrest since the national dialogue resumed in mid-February. Videos on social networks show that the more than 100 detainees were taken to an auditorium at El Chipote, where they continued to demonstrate against the regime. “He who does not jump is a toad”, they sang. Shortly after 10 PM, the 167 citizens were removed. They left El Chipote in three buses, which in passing through the streets of Managua were cheered by the residents. They were released in the facilities of the Federation of Livestock Associations of Nicaragua (Faganic), where dozens of people were waiting to hug them. “What today’s mobilization has shown is the need for the people to take to the streets and not be intimidated by repression,” said ex-guerrilla commander Monica Baltodano, who was one of the abducted.